Originally posted at Pagan Families, 12/19/14. I received a complementary review copy of this book. 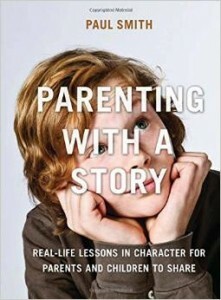 Paul Smith, Parenting with a Story: Real Life Lessons in Character for Parents and Children to Share (AMACOM, 2014). 272 pages. Once upon a time my mother stepped out of a friend’s car and down an open sewer grate. Fortunately she grabbed onto the sides of the hole as she fell, and her friends helped her climb back out. My mom told me the story a decade and a half later, when I was a little girl, and the idea that I might fall into a sewer followed me for a decade after that. Stories are an excellent tool for communicating potential risks, and that’s what many of my mother’s stories did. I wish instead that she’d given me more tales like the ones Paul Smith tells in Parenting with a Story, which is more concerned with spiritual or psychological pitfalls than literal ones. Parenting with a Story is Smith’s collection of stories for inspiring sound decision making and strong character. As Smith notes, stories are more helpful to children navigating tough situations than straight-out advice is. It can be hard to figure out how to apply general principles to the circumstances you’re in, and hard to figure out why the advice is good. Hearing a story shows kids what kind of results can follow from a course of action and helps them reimagine what a happy ending to their situation might look like. Telling a story instead of giving advice also leaves room for kids to think for themselves and helps defuse the power dynamics that can make it harder for independence-craving kids to take advice. I’d add that hearing someone else talk about a problem can give the child a sense of being seen and acknowledged without being scrutinized, while engaging with a story lets children think about their problems from a safe distance. But where do you come up with the stories? Maybe some of them are in this book. After interviewing over a hundred people, Smith chose 101 of the most compelling personal stories and arranged them according to the virtues they teach, covering everything from open-mindedness and goal-setting to kindness and appreciation of beauty. The idea is that you can consult the book, find relevant stories, and retell them to your young person in an age-appropriate way. Most of the stories are over my five year old’s head, but I imagine they’ll be more relevant by late elementary school. Smith provides a handy index of story themes in the back, and an online discussion guide as well. Parenting with a Story furnished me with some memorable tales, and I’m likely to consult it from time to time in the future. The book is at its strongest when Smith lets stories speak mostly for themselves and chooses tales that nuance each other, as he does in the chapter on setting goals. It’s easy enough to read past the book’s preachier parts if you just want the stories; however, I’d advise against reading large helpings of the book at once, unless you’re particularly fond of motivational speaking (which is Paul Smith’s business). The book reminded me of a commencement address at times, partly because of Smith’s tendency to locate his subjects by mentioning their colleges, career paths, and degrees, and partly because of the familiar cultural archetypes featured in many of the stories. For example, Smith talked to a real life version of the proverbial kid who grew up to be creative because she and her siblings didn’t have electronic toys as children. Are these kinds of stories potentially useful for kids, if they’re handled sympathetically? Sure, and presumably that’s how many of them got their archetypal quality. I’m having a hard time figuring out how to tell the stories, though, even the age-appropriate ones. I tell a lot of stories to my family already, and I’ve casually tried out a couple of the ones from this book. But it’s hard to introduce a personal story about a person you have no connection to, and the stories lose resonance in the process. For example, Smith relates a story about a boy who poked around the house until he found where his Christmas presents were hidden. At first he was excited, but then he realized he’d still have to wait all the way until Christmas to play with them. He’d need to pretend to be surprised when he unwrapped them, so that his parents wouldn’t be disappointed or guess what he’d done. It wasn’t much fun. And so from then on, he resisted the impulse to spoil surprises. Now, if this were a story about my own experience, the kids would love it and the story would have experiential authority. Telling the story about someone we don’t know is okay as an adjunct to asking, “How would you feel if you found your Christmas presents?”–but much of its power has drained away. The more surprising the story’s outcome or the more implicitly confrontational the story is, the more it benefits from being a story about someone you’re connected to. -What’s the biggest mistake you’ve ever made? Why? -What are three of the smartest decisions you’ve ever made? -Describe a time when you faced someone or something you were truly afraid of. How did it turn out? -Can you remember a time as a child when you did something you had been told not to do and you did it anyway? How did it turn out? Do you wish you had obeyed and hadn’t done it? Or are you glad you did it anyway? -Tell me about a time in your life when you learned a hard lesson about the value of _____. Then fill in the blank with a topic of interest. -What stories do you remember hearing as a child that taught you so valuable a lesson you still remember them to this day? So, who’s ready to hear more stories?